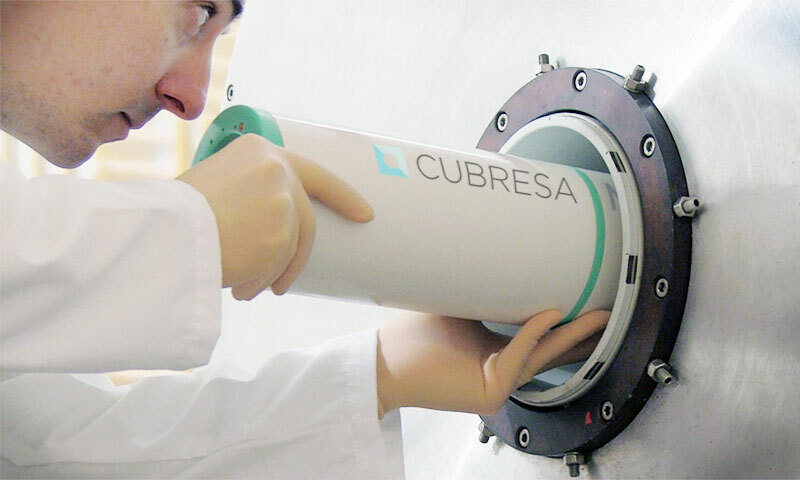 Preclinical PET Scanner for Simultaneous PET/MRI Adds to Cancer Research Arsenal at the University of Arizona | Cubresa Inc.
Cubresa’s NuPET™ scanner enables simultaneous preclinical molecular & functional imaging. The PET (Positron Emission Tomography) scanner inserts into existing MRI (Magnetic Resonance Imaging) systems and can speed drug development and clarify disease mechanisms for biomedical researchers. Cancer researchers can better understand tumors using Cubresa’s NuPET™ PET scanner with an MRI to see and measure responses to therapy in living subjects, advancing development of individualized patient treatment. Winnipeg, MB – May 31, 2016 – Cubresa, Inc., a medical imaging company that develops and markets molecular imaging systems, today announced that their compact PET scanner called NuPET™ for simultaneous preclinical PET (Positron Emission Tomography) and MRI (Magnetic Resonance Imaging) has been selected by the University of Arizona (UA). PET and MRI are complementary imaging methods for better understanding disease and testing novel treatments in small animal subjects. The University of Arizona will be the first institution in the United States to acquire this instrument. Currently, the University of Arizona does not have small animal PET service on campus. This PET/MRI system will bring a new capability to UA research endeavors. The UA purchased the NuPET™ scanner in collaboration with the Department of Medical Imaging and the UA BIO5™ Institute in order to fully exploit a unique MRI method and the synthesis of contrast agents that relies on patented technology from Pagel’s lab to measure a tumor’s acidity. Studies have shown that measuring a tumor’s pH factor could help doctors to monitor the effect of a variety of treatments on solid tumors and normal tissue, and could even predict the effectiveness of chemotherapies before the patient starts the medication. Faculty at the University of Arizona are primed with two research areas to begin work when the PET insert arrives. First, they have developed an MRI method that measures tumor acidosis. Tumors have high metabolism and generate a lot of lactic acid, a process known as aerobic glycolysis. PET is often used to track the start of aerobic glycolysis by detecting a radioactive form of glucose (fluoro-deoxyglucose, or FDG) that is rapidly transported into cancer cells. Pagel and colleagues plan to combine the existing MRI method with the FDG PET method to track both the start and end of aerobic glycolysis in tumors. This will improve the assessment of tumor biology, especially changes in tumor biology in response to therapies. Second, researchers at the UA have developed a PET/MRI contrast agent that is detected with both PET and MRI. This hybrid chemical contrast agent will allow them to measure tumor acidosis very accurately. There are advantages to a “one agent injection” method vs. the injection of a cocktail of 2 agents for PET and MRI that are described above in the first project. The University of Arizona has strong interests in translating their new methods to the clinic to improve the detection of tumors, and to assess early responses in tumors that are caused by chemotherapies. The UA also plans to obtain a clinical PET/MRI scanner in 2018, so researchers will be ideally suited for this clinical translation in about 18 months. Cubresa will showcase the NuPET™ scanner in Booth 1148 at the SNMMI (Society of Nuclear Medicine and Molecular Imaging) 2016 Annual Meeting in San Diego, June 11—14, 2016. Cubresa is a medical imaging company that develops and markets nuclear imaging systems that enable researchers at leading universities, hospitals and pharmaceutical companies to non-invasively visualize and measure biochemical processes at the molecular level. Applications for Cubresa’s products include preclinical drug development, disease research in oncology, neurology, and cardiology, as well as clinical diagnostics. Cubresa has operations in Boston, Massachusetts and Winnipeg, Manitoba. Visit www.cubresa.com for more information. The University of Arizona Health Sciences is the statewide leader in biomedical research and health professions training. The UA Health Sciences includes the UA Colleges of Medicine (Phoenix and Tucson), Nursing, Pharmacy and Mel and Enid Zuckerman College of Public Health, with main campus locations in Tucson and the growing Phoenix Biomedical Campus in downtown Phoenix. From these vantage points, the UA Health Sciences reaches across the state of Arizona and the greater Southwest to provide cutting-edge health education, research, patient care and community outreach services. A major economic engine, the UA Health Sciences employs almost 5,000 people, has nearly 1,000 faculty members and garners more than $126 million in research grants and contracts annually. For more information: http://uahs.arizona.edu. The University of Arizona Cancer Center is the only National Cancer Institute-designated Comprehensive Cancer Center headquartered in Arizona. The UACC is supported by NCI Cancer Center Support Grant number CA023074. With primary locations at the University of Arizona in Tucson and at St. Joseph’s Hospital and Medical Center in Phoenix, the Cancer Center has more than a dozen research and education offices in Phoenix and throughout the state and 300 physician and scientist members work together to prevent and cure cancer. For more information: http://uacc.arizona.edu/. The University of Arizona Department of Medical Imaging is a national leader in innovation, cost-effective diagnostic and minimally invasive therapeutic technologies, applications and research. The department provides the latest radiology services, serves as a destination site for groundbreaking medical imaging research and educates the next generation of leaders in imaging science and its applications. For more information: http://medicalimaging.medicine.arizona.edu/.